Mixtab is a very elegant news reader for your Mac. This application uses very attractive tabs to keep you updated with all of your favorite news sources, including RSS feeds. When you launch the application you get a bunch of thumbnails representing specific categories. Each category will then contain your favorite sources. You can easily customize tabs to your liking, such as create a cars tab, and then add all of your favorite car news sources, including any RSS feeds you may have. You can also download pre-made tabs that will contain news sources chosen by other users. This will help you tremendously if you are looking to learn about a certain topic but dont quite know where to start. Unfortunately, Mixtabs features and interface leave a bit to be desired. Mixtab contains absolutely no syncing support. This makes things very frustrating if you are on the go and don’t have access to your Mac. If Mixtab functioned properly with syncing services like Google Reader, then it would be much more useful. The way Mixtab functions makes it seem like you are only supposed to view news on your computer. In addition, Mixtab’s interface can sometimes make it difficult to tell which news story is from which source. This can be annoying because sometimes you want to know the source of an article so you can better understand the perspective. 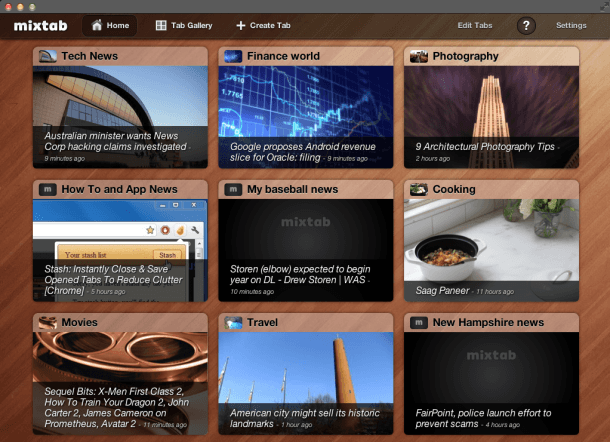 Overall, Mixtab can be very functional as a standalone application. But if you are looking for something that can easily sync across all of your devices, then you’re going to want to look elsewhere. The user interface, while somewhat annoying and confusing, can in fact be gotten used to. Mixtab is generally good at what it does and it looks absolutely beautiful while doing it, but it still doesn’t sport enough features to be your primary reader across all devices.